Atorvastatin only comes in the form of a tablet you take by mouth. Atorvastatin is used to improve cholesterol levels and decrease your risk for a heart attack and stroke. It’s used together with diet, weight loss, and exercise. Muscle problems: Your risk of muscle breakdown is increased while taking atorvastatin. The risk is greater if you’re a senior, have thyroid problems, or have kidney disease. Tell your doctor right away if you start to have unexplained muscle soreness, pain, or weakness. Liver problems: Lab tests for your liver may be abnormally high while you’re taking atorvastatin and you may have liver problems. Your doctor will monitor this while you’re taking this drug. Diabetes: Atorvastatin may increase your blood sugar levels. You and your doctor should monitor your blood sugar levels carefully while you’re taking this drug. Atorvastatin oral tablet is a prescription drug. It’s available as a brand-name drug called ATORTAJ. It’s also available in its generic form. Generic drugs usually cost less. In some cases, they may not be available in every strength or form as the brand-name version. Atorvastatin is used to improve cholesterol levels in people with different types of cholesterol problems. It’s also used to decrease your risk for a heart attack and stroke. It’s used together with diet, weight loss, and exercise. This drug helps to prevent cholesterol from building up in your arteries. Clogged arteries can block blood flow to your heart and brain. Atorvastatin may be used as part of a combination therapy. This means you may need to take it with other medications. These may include bile acid resins and other cholesterol-lowering medications. Atorvastatin belongs to a class of drugs called HMG-CoA reductase inhibitors, or statins. A class of drugs is a group of medications that work in a similar way. These drugs are often used to treat similar conditions. This drug works by lowering your low-density lipoprotein (LDL) or “bad” cholesterol and raising your high-density lipoprotein (HDL) or “good” cholesterol. This medication improves your body’s ability to get rid of the LDL cholesterol through your liver. Atorvastatin oral tablet doesn’t cause drowsiness, but it can cause other side effects. Atorvastatin oral tablet can interact with other medications, vitamins, or herbs you may be taking. An interaction is when a substance changes the way a drug works. This can be harmful or prevent the drug from working well. Examples of drugs that can cause interactions with atorvastatin are listed below. Taking rifampin with atorvastatin may lower the amount of atorvastatin in your body. This means that the atorvastatin may not work as well. Atorvastatin can increase the amount of digoxin in your blood to dangerous levels. Your doctor will monitor these levels and adjust your medication doses if needed. Atorvastatin may increase the levels of oral contraceptive hormones in your blood. Taking this medication with atorvastatin raises your risk of muscle breakdown. Avoid drinking large amounts of grapefruit juice while taking atorvastatin. Drinking grapefruit juice can lead to a buildup of atorvastatin in your blood, which raises your risk of muscle breakdown. Ask your doctor how much grapefruit juice is safe for you. The use of drinks that contain alcohol raises your risk of liver disease from atorvastatin. Talk to your doctor if you drink more than 2 glasses of alcohol per day. For people with kidney problems: Having kidney problems raises your risk of muscle breakdown (rhabdomyolysis) while taking atorvastatin. Your doctor may monitor you more closely for muscle problems. For people with liver disease: You shouldn’t take this if you have liver disease since this medication can increase your liver test results. This means that you may have liver damage. For people with diabetes: Atorvastatin may increase your blood sugar levels. Your doctor may adjust your diabetes medications if this happens. For pregnant women: Atorvastatin is a category X pregnancy drug. Category X drugs should never be used during pregnancy. For women who are breastfeeding: Atorvastatin may pass into breast milk and may cause side effects in a child who is breastfed. Talk to your doctor if you breastfeed your child. You may need to decide whether to stop breastfeeding or stop taking this medication. For seniors: People over the age of 65 years have a higher risk of muscle breakdown (rhabdomyolysis) while taking atorvastatin. For children: Atorvastatin hasn’t been studied and shouldn’t be used in children younger than 10 years. This drug has been shown to be safe and effective in children 10–17 years of age. The standard starting dose is 10–20 mg taken by mouth once per day. Usual doses range from 10–80 mg taken once per day. Atorvastatin hasn’t been approved to be used in people younger than 18 years for the prevention of heart disease. When treating homozygous familiar hypercholesterolemia, the dose is 10–80 mg taken by mouth once per day. In children, atorvastatin is only used to treat heterozygous familial hypercholesterolemia. The recommended starting dose for heterozygous familial hypercholesterolemia is 10 mg once per day. The maximum recommended dose is 20 mg once per day. Atorvastatin hasn’t been studied and shouldn’t be used in people younger than 10 years. 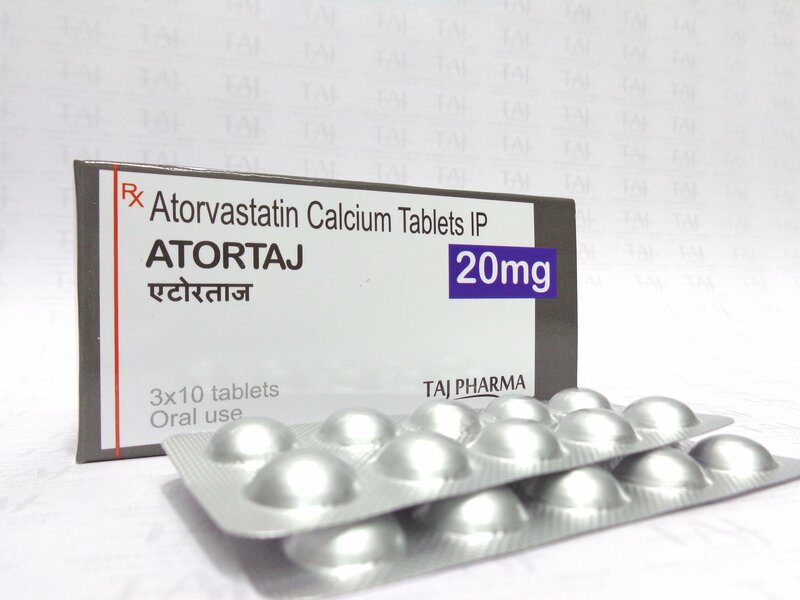 Atorvastatin oral tablet is used for long-term treatment. It comes with risks if you don’t take it as prescribed. If you stop taking the drug or don’t take it at all: While eating a healthy diet can sometimes improve your cholesterol levels, atorvastatin can help them even more. If you don’t take atorvastatin, your cholesterol levels may not be controlled. This may raise your risk of a heart attack or stroke. How to tell if the drug is working: You won’t be able to feel atorvastatin working. Your doctor will measure your cholesterol levels to see how well atorvastatin is working for you. Your doctor may adjust your dosage depending on your cholesterol levels. Keep these considerations in mind if your doctor prescribes atorvastatin oral tablet for you. Store atorvastatin at room temperature between 68°F (20°C) and 77°F (25°C). Keep it away from high temperatures. While you’re being treated with atorvastatin, your doctor will check your cholesterol levels and liver function. This will be done through blood tests. Your doctor may have you follow a low-fat, low-cholesterol diet while you take this drug.